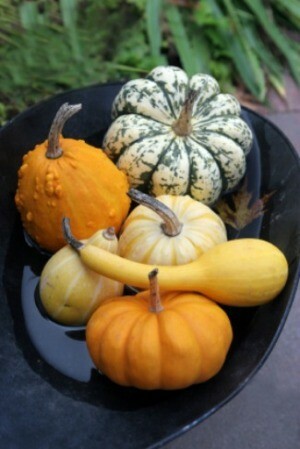 Though not very good to eat, gourds are easy to grow and useful in many other ways. This guide is about growing gourds. If you've had success growing pumpkins or squash, you might want to consider trying your luck with gourds. Since most gourds have a long growing period (from 90-130 days) now is a great time to start them indoors. They aren't very good to eat, but they are notoriously easy to grow. And if history is any indicator, you'll find plenty of other uses for them. Turn them into birdhouses, bath sponges, bowls, scoops, centerpieces, Christmas tree ornaments, trinket boxes-even jewelry. There are three basic groups of gourds: Hardshell, Luffa and Ornamental. All grow on vines like cucumbers or squash, but they all differ in size and appearance. Also sometimes referred to as Bottle gourds, Hardshell gourds take the longest time to mature. (110-130 days). These gourds are heavy with a tough outer skin and a round or tear-drop shape. Hardshell gourds are often made into bird houses or carved with ornate patterns and made into bowls or boxes after they are dried and cured. Start Hardshell seeds early (indoors) if you live in a climate with a short growing season. The seeds are hard and rigid and should be soaked for a day to two to speed up germination. Most of this gourd's early growth takes place below the soil so make sure you give their roots plenty of room to grow when they are just starting out. Hardshell gourds mature late but their vines grow quickly and can reach over 100 feet in a single season. Provide vines with a sturdy trellis or vertical support immediately after sprouts are transplanted. Fruit should be supported off the ground with slings made from nylon hose or socks to prevent rotting and keep fruit from developing flat spots. Prop them upright in place on the ground (on a can or cardboard) if you want them to develop a flat bottom for craft purposes. 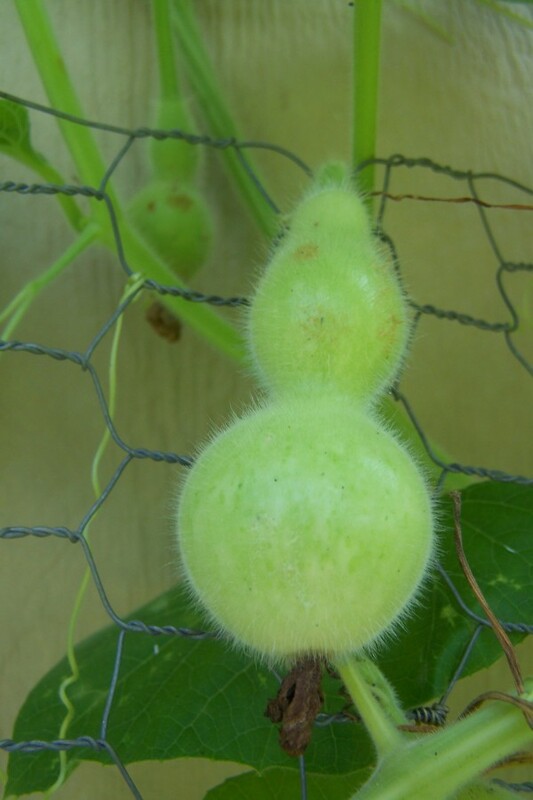 Luffa gourds, also called vegetable sponges, need approximately 110 days to mature and should be started early (indoors) in climates with short growing seasons. These are the gourds you see as luffa sponges in the bath and cosmetic sections in department stores. Luffa seeds should be soaked for at least 24 hours before planting to speed up germination. Seeds tend to sprout rather erratically and young plants should be monitored carefully for disease. Provide growing plants with a sturdy support for climbing as soon as new growth emerges. 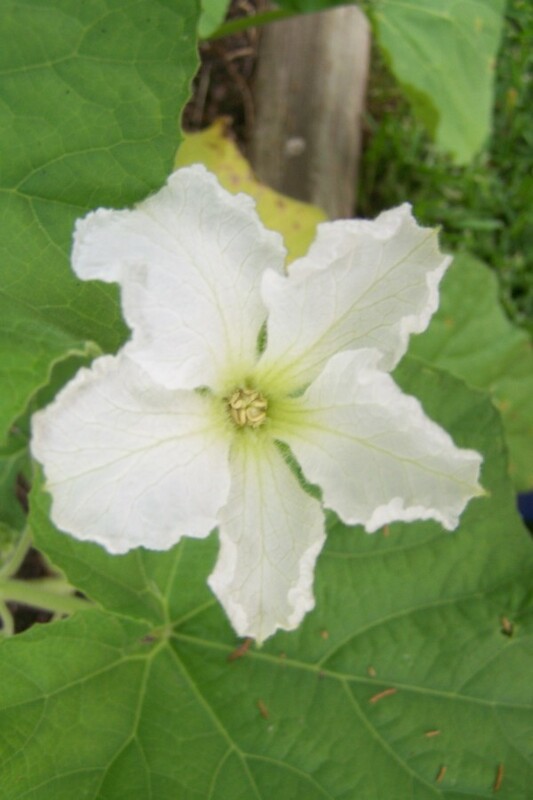 When Luffa gourds are healthy, their leaves are a bluish-silver color. Leaves that lose this color indicate the plant needs a boost of fertilizer. Luffa gourds can be harvested when the outer skin turns brown or yellow or left on the vine until completely dark brown. To prepare the luffa for use, peel off the outer skin and shake the seeds lose. Ornamental gourds are a good choice for gardeners with shorter growing seasons. They are the quickest gourds to mature-needing about 90 days. 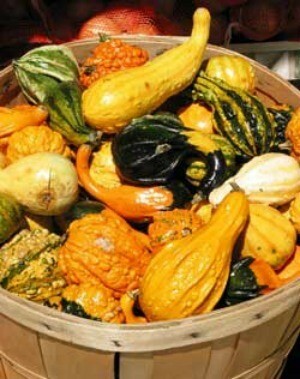 These gourds are smaller and come in a variety of bright colors and interesting shapes. Ornamental gourd seeds do not require soaking before planting. Their outer skins are less tough than the other gourd types, which leave them more vulnerable to insect damage (aphids, cumber beetles, slugs, squash bugs and vine borers). Harvesting Ornamental gourds is trickier because they are not left on the vine as long as other gourds. If left on too long their bright colors will fade. Taken off too soon and they will rot. When harvesting, cut the gourds from the vine that feel the hardest first. They will generally going to be gourds located closest to the mound. Soil Requirements: Ideally, gourds should be planted in mounds of nutrient rich, well-drained soil with a pH of 5.8-6.2. Space mounds about 4 feet apart with 3-4 seeds to a mound. Mulch around plants to control weeds. 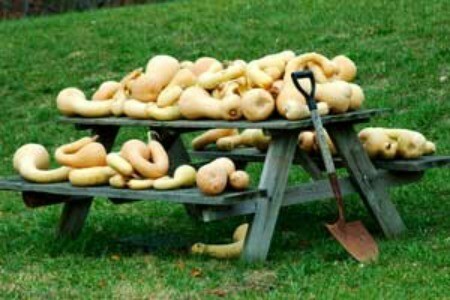 Gourds will deplete the soil of nutrients and should not be planted in the same place in consecutive years. Exposure: Full sun. Plant them several hundred feet away from late varieties of squash and pumpkins to avoid cross pollination. Feeding: Fertilizing gourds is generally not necessary, but plants can be given a balanced organic fertilizer or side-dressed with well-rotted manure once about mid-season. Watering: Gourds are not drought tolerant. Soil should be kept consistently moist (not wet) and plants should be watered at least once a week during dry periods. Supports: Fruits are heavy and plants are fast climbers. They should be provided very sturdy supports while growing. Harvesting: Gourds should be left on the vine until the stems die back and turn brown unless there is danger of a hard frost. Handle mature gourds with care and place them in a warm place with good air circulation to dry. When you shake them and hear their seeds rattle they are completely dry. Hardshell gourds can be carved, wood-burned, painted, stained, drilled and cut for craft purposes. The skins of Luffa gourds are peeled after drying to expose the fibers for scrubbing or for use as bath products. Ornamental gourds are generally harvested when they reach their peak color and used for decorations. Get 2 packages of miniature gourds and plant them in two long rows. You will have so many that you will be able to sell many of them to garden shops. Now pick out flower seeds, baby's breath and other grasses that will dry. Is it OK to cut the vines of bird house gourds to allow the gourds to grow larger or will this hurt the plants? We have grown them a few times, but seem to have smaller fruits to harvest before frost strikes. Thanks. what do you mean "cut the vine?" Do you mean prune? Can I grow gourds in 5 gallon buckets? I'd like to grow some of those little gourds that look like hens eggs. I have the seeds, and am ready to plant. But we don't have enough space for sprawling vines in the yard. Could I plant these seeds in a 5 gallon plastic bucket? Perhaps if I drilled holes for drainage, put some gravel in the bottom and used very good potting soil in the bucket? Then when they started growing, I could place a trellis for the vines to grow on? Any ideas would be great! I'm with Cheryl (see feedback forum). Why not try it? Not only will you save space, but by growing them vertically, each gourd will receive more light and the vines will be less susceptible to borers and other pests diseases. I once read about a man who planted pumpkins in 5-gallon buckets that he nailed along the roof of his garage. As I recall, his intention was to grow a mass of vines that would eventually cover his roof and provide shade for his garage. I'm not sure he produced many pumpkins, but he got his shady roof for sure. Light-colored buckets (maybe 2-3 seeds in each) or large terra cotta pots will probably work best for this project. Gourds climb like monkeys so they will also need supports. Make sure to put a sturdy trellis of some kind in each pail. After the seedlings emerge, cover the top of the soil with some course mulch. This will help keep the soil cool while helping retain moisture. If the plants start to decline and you suspect the roots are getting too hot, you might try deflecting some of the heat away from the bucket by wrapping the outside of the bucket with something shiny like aluminum foil. Just like anything grown in containers, watch moisture levels carefully. Gourds like a lot of water to begin with, so plan to check them everyday. How much (if any) fertilizer gourds need depends on whom you ask. Some growers claim they need a little bit, others say they need none at all. I don't normally fertilize gourds when growing them in the ground, but if I was growing them in containers I would consider giving them a balanced (10-10-10) liquid house plant fertilizer (diluted to half strength) early in the season, and then again about mid-way through. Better yet, you might periodically top the soil off with a little compost. Keep your gourds well away from pumpkins, squash, and other cucurbits in the garden to avoid the possibility of cross pollination. The major challenge here will be to keep the bucket somewhat cool ie. out of the sun (you don't want to cook the roots), but still provide enough sun for the plant's leaves and fruits. Why not give it a try? Nothing ventured, nothing gained. Can I grow gourds around live oak trees? I cannot put up trellises and I thought they would look nice on the trees. Would it damage the tree? I just read that gourds deplete the soil of nutrients. Would this harm my trees? This is my first time growing gourds some of them are starting to turn white. Is this normal or am I doing something wrong? As long as they don't show signs of rotting or damage, I wouldn't worry about it. Several varieties of gourds turn white when they mature, and others go through several color changes as they develop, including white, before they set their final color. When the stems start to dry and turn brown, you'll know your gourds are ready for harvesting. Most varieties will tolerate a light frost providing that they have matured sufficiently enough to form a semi-hardened shell. Less mature gourds are likely to suffer damage from frost and may need to be discarded. Be careful not to bruise your gourds during harvest. Even slight bruising can put them at a greater risk for decay during the drying process. To harvest, cut the gourds from the vines with a sharp knife or shears, leaving each gourd with a few inches of stem. Before curing, wash the gourds in warm, soapy water to remove any dirt and wipe them down with a soft cloth moistened with bleach water or rubbing alcohol. This will help to destroy any organisms that promote rotting. Dry each gourd with a soft cloth and place them in a single layer on newspaper or paper bags so that they don't touch each other while curing. The curing process takes several weeks and should be done in a warm, dry location with plenty of air circulation (e.g. shed, barn or garage). Inspect the gourds frequently throughout the curing process. Turn them occasionally and discard any that show signs of decay. The gourds are dry when the seeds rattle inside. Smaller gourds can be used as they are or preserved with wax, shellac, or paint. Large gourds can be polished smooth with steel wool or fine grade sandpaper and then painted, stained, or waxed for preservation. This flower eventually turned into a gourd, it was grown in my garden. Last month, I asked if any of the readers could identify the flower. Congratulations to the one person who did! For those who saw my "baby" gourds right from the start, this is all I finished up with. No exactly what I was hoping for BUT there is always next year!